ArteyArte has the 3D design and micro SLA printing technology for jewellery prototypes in visijet material ready for production of piece. Jewellery is another specialty in which 3D printing and design found its place. We have the most advanced technologies for designing and creating jewellery application. 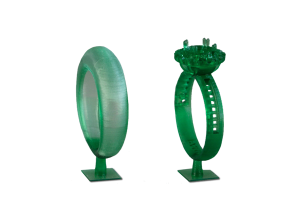 Through design techniques and Micro-SLA 3D printing, ArteyArte creates prototypes in VisiJet green material ready for smelting and its future manufacture of all kinds of parts for jewellery.